In Group Dance Classes, a variety of patterns and the ability to lead or follow any partner will be learned. Group dance classes are lots of fun and provide the student with the opportunity to meet other students at the same dance experience level and with similar dance goals. Group Dance Classes are an excellent supplement to private dance lessons, and are regularly scheduled throughout the week. 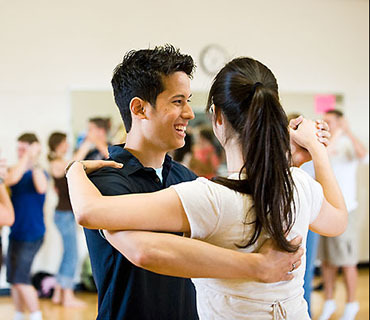 Dance Classes are available in all of the most popular styles of partner dancing and are arranged by experience levels ranging from beginner, novice, intermediate, and advanced proficiency levels. We recommend all new students begin with a free private dance lesson before attending group dance classes. Once we get to know you and your dance level a little better, we will be able to better recommend which level of group classes are right for you.